Rushmore (LSD-14) was laid down as HMS Sword 31 December 1943 by Newport News Shipbuilding & Dry Dock Co. Newport News Va; launched as Rushmore 10 May 1944 sponsored by Miss Eleanor Vreelan Blewitt and commissioned 3 July 1944 Lt. Comdr. E. A. Jansen USNR in command. 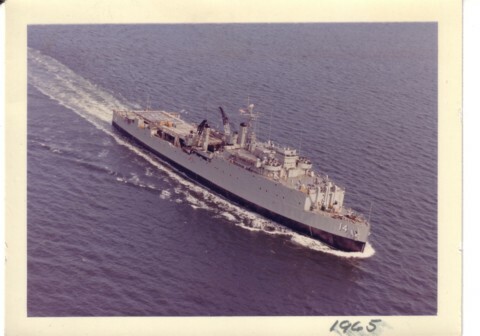 Following shakedown in the Chesapeake Bay landing ship dock Rushmore departed Norfolk 5 August 1944 for the Pacific where she participated in four amphibious landings: Leyte Gulf in October 1944 Palawan in February 1945 Mindanao in March1945; and Tarakan Borneo in May 1945. Rushmore entered Leyte Gulf early in the morning of 20 October and after discharging her LCM's from her boat well in one of the first waves to hit Yellow Beach near Dulag acted as repair ship for damaged landing craft. At Palawan on 28 February 1945 she landed Army-manned LCM's and other craft loaded with personnel and equipment of the 167th Field Artillery of the U.S. 8th Army. At Mindanao she carried a record 867 men for a 10 March landing on a beach north of the city of Zamboanga. For the invasion of Tarakan on 1 May Rushmore carried U.S. Army-manned LCM's loaded with Australian troops and light tanks. The Australian troops were of the famed "Rats of Tobruk" battalion which had helped to chase German General Rommel out of Africa. During this landing Rushmore was hit by a Japanese torpedo fired from the beach which fortunately glanced off her hull without exploding or causing damage. Returning to the Philippines Rushmore loaded a 137-foot Japanese submarine which she carried to San Francisco to serve as a display to help sell war bonds. In the United States from 2 June to 27 June Rushmore next carried landing craft from base to base in the South Pacific and was in Pearl Harbor when the war ended. After the war Rushmore operated in the Far East particularly in occupied Japanese waters. She decommissioned 16 August 1946 and was mothballed in Pascagoula Miss. On 16 May 1960 Rushmore departed Norfolk for a 6-month tour with the 6th Fleet. Returning to the Atlantic coast she again deployed to the Mediterranean in late 1961. Returning to Little Creek 22 February 1962 she operated in the Atlantic and Caribbean before a Fleet Rehabilitation and Modernization overhaul. On 9 November Rushmore hurriedly left the Bethlehem Steel Yards Hoboken N.J. because of the Cuban crisis and sailed to North Carolina to embark Marine units. However with the easing of the situation in December she returned to Little Creek. On 4 February 1963 Rushmore began a 5-month deployment to the Mediterranean. >From December until February 1964 she operated in the Caribbean remaining near the Panama Canal Zone area during and after the riots there ready to land troops to protect American citizens and Government property. Operating in the Atlantic and Caribbean until 6 October she then departed the United States for Europe and the largest amphibious assault yet staged in peacetime Operation "Steel Pike." She returned to Little Creek 26 November. Rushmore was again deployed to the Mediterranean from 8 February 1965 to 24 July participating in joint Norwegian-American and French-American exercises. In the summer of 1966 Rushmore made two midshipmen cruises. For the next 4 years she alternated deployments to the 6th Fleet in the Mediterranean with operations off the U.S. Atlantic coast. She deployed to the Mediterranean November 1966-May 1967 January 1968-May 1968 and November 1969-April 1970. Ordered inactivated soon after her return Rushmore decommissioned 30 September 1970 and was transferred to the Maritime Administration's National Defense Reserve Fleet James River in February 1971.